The Basil Basimply II is a practical choice of bike basket that attaches to the handlebars of your bicycle. Easily mounted to your bike, it’s an ideal choice. The Basil Basimply II bicycle basket is made from hard-wearing plastic with a sturdy rattan construction, with a water-resistant finish that makes it ideal for all weather adventures on your bike. Planning a trip to the supermarket? If you’re looking for a bike basket that offers convenient storage for your groceries, this basket is a brilliant choice. Need something to cart your daily essentials to and from the office? The Basimply II is a quality choice for the commute. 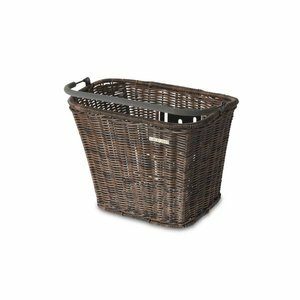 Thanks to the soft-grip handle, you can remove this basket in moments, taking it with you once you’ve finished cycling. Available in a natural brown shade, it makes an attractive complement to almost any style of bike frame. Thanks to the handy slots at the edges of this basket, you can also adjust its height placement in convenient increments. Suitable for use with the BasEasy mounting system, or via the use of the klickfix system, you’ll be able to upgrade your bicycle in no time at all with this must-have piece of storage. Please note, mounting systems and attachments are sold separately. Inspired to upgrade your bike with more eye-catching accessories? Browse the complete range from Basil online today. Made from synthetic rattan material for a performance in all weathers. Convenient slots allow for fuss-free height adjustments. This basket is suitable for use with BasEasy mounting systems and the klickfix attachment system. Order separately online at Basil. Suitable for both men and women’s bikes for all manner of cycling adventures.